Q: What to do with unfulfilled desires? The lifelong desire of prosperity in relationships goes unfulfilled. As time passes I feel frustrated, regretful, and my energy sapped. How do I manifest these desires and let them go? Sri Sri Ravi Shankar: You say it is a lifelong desire. Is it really a lifelong desire? Did you have the same desire when you were a kid, or when you were a teenager? Just take a look at it. Is the desire worth all the effort and time you are putting into it? Or can your life be very useful in some other way? These are a few things that you need to ponder upon. As your energy builds up, let go and you will find that desires just happen. The more you hang onto them, the more you hold on and crave for it, the longer it takes. That is a fact. Q: Dear Guruji, I know that you love me, but I don’t love myself. I wish I was more comfortable within myself and with others around me. What to do? 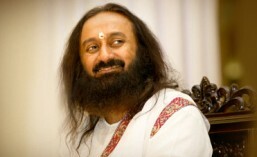 Sri Sri Ravi Shankar: You are doing the right thing; Advanced Meditation Course. That is the first thing we do in the course, praise yourself and praise your partner. Didn’t you do that? Do that sincerely. Don’t think that this is just another exercise and they are just asking me to praise, no! Do it seriously. Some of these exercises may appear silly to you on some level, but on another level they really have some impact on our consciousness and our subconscious mind. Stop blaming yourself – this is the first law of spirituality. The more you blame, the more you will be away from you own spirit. So you should stop blaming yourself and recognize the good qualities that you have. Continue doing this and it will happen. Sometimes these patterns, these old habits take a longer time to ease out. As you become aware, ‘I have to stop blaming myself’, then suddenly your energy goes up. And do pranayama, it definitely helps. When energy is higher, there is no way that you will continue to blame yourself, that is not possible. Q: How do I get rid of my fear? I have fear for everything. Everything is scary. Fear of failure, fear of the future, fear of death, fear of flying. Everything! Please help. Sri Sri Ravi Shankar: Fear is simply an emotion or a sensation in the body. There is no need to associate or attach it to different things. When you start observing those patterns, those energies that happen in you, you will see that fear, love and hatred all happen in one region, and it is the same energy which manifests love, hatred or fear. When you have some passion; if you are passionate about something, fear disappears. Fear appears when you don’t have any specific passion in life. Isn’t this the experience? Only when you have passion, or strongly hate something, then fear will disappear. Fear will disappear when you either have a strong hatred or strong love towards something. In the absence of either, a little lingering fear comes up. But, again, more hollow and empty meditations, pranayama, engaging in some seva activities; all this will help in eliminating that. Q: If you have a child by mistake, and you are not married; growing and accepting the child and the mother, even though you do not love the mother and letting go of the love of your life because of a mistake; what does one do? Is this it? Sri Sri Ravi Shankar: Listen, move on. Move on! That is all I can say. Don’t sit and brood over it, okay. Just move on. Life is much more. You have many roles to play. First of all you are a beautiful citizen of this beautiful planet. Recognize that. You are part of a universal light, recognize that; and then you have all of the roles to play, as a mother, or a son, or a daughter or whatever. You make a determination, ‘Nothing is going to put me down. I am going to play whatever role I am supposed to play 100%’. That is it; it will start happening that way. Q: My mother passed away a year ago from cancer. I am doing my best, but how do I allow myself to feel free fully from this? Sri Sri Ravi Shankar: Time heals. Broaden your vision. Q: How can I get purer? Even though I am doing Sadhana, Satsang and Seva, I do not feel very pure. When I see people who are arrogant, rude and proud, especially Art of Living people, I feel very sad. How do I get rid of this? Sri Sri Ravi Shankar: You are saying two things. One you are saying that others are arrogant, others are not okay; and the other thing you are saying is you are not okay. This is just mirroring; you are mirroring in both sides. I would say if you feel that you are impure, pranayama and proper food will help. If you still feel that you are not okay then just go on a fruit and vegetable diet for a couple of days and just sing and chant. When you are sitting in satsang and singing how can you say that you are impure? There is no way. Don’t you feel when you are sitting in satsang that how much ever impurity you might have felt in the mind, it all got lifted up? How many of you feel that way? (Many raise their hands). ‘Nahi Jnanena sadrusham pavitram iha vidyate. Tat swayam yoga samsiddhaha kalen atmani vindathi.’ – (Srimad Bhagavad Gita chapter 4, verse number 38) The old saying is – there is nothing better than knowledge which can purify your mind, your soul and your spirit. Knowledge purifies. Sit and listen to Ashtavakra Gita for half an hour or 20 minutes; you will feel uplifted. About your feeling that others are arrogant – it is good that these people have come to me, here, in The Art of Living. I feel happy about it and I have patience, you also keep patience. I patiently keep waiting. Out there in the world they would’ve created problems and so much trouble to so many. At least here they are in less difficulty, and they are giving you an exercise to practice the first principle – accept people as they are. Also, I would like you to know that The Art of Living people are not a special species from somewhere, they are normal people in the world and they have all the traits of the people in the world. They are not different. Yes, your expectations from The Art of Living people is more because you think they are soaked in knowledge, they are in love, they serve people. So your expectations are much higher because you see that they are very privileged. That is correct! But you start from yourself first, you are so privileged, you have the patience to accept everybody. People ask me questions, ‘Why have you made such people teachers who are so arrogant, who are so angry’, and so on. I tell them that I need all specimens and all species; all types of people. I carry them along and everybody is comfortable with me, and I am comfortable with everybody. I have patience to see them grow. That is how The Art of Living has grown. If I was looking for perfection, I tell you, we won’t be here today. We would not be sitting here today. I would be somewhere else and you would be somewhere else. We need to have patience. It is like, in a school, you cannot expect all the kids to be in one class. And it is not that one class is superior to other class. It is not as if the nursery kids are superior to the primary kids. There is no superiority, it is just the way they are. It is just the time and pace they take to grow from one class to another, from one level to another. People keep growing, and we need to have patience. And I tell you, it tests your patience, and it is good. Q: If I pray to you sincerely with utmost longing and all my heart, are you able to listen and answer my prayer even though I am miles and miles away from you physically. Sri Sri Ravi Shankar: You know, cell phones don’t have miles. When you can connect with people around the world with a little plastic box called cell phone by just pressing some buttons, why do you underestimate your brain, your heart and your feelings, which are many times more powerful than a plastic toy? I tell you it happens, doesn’t it? A close friend somewhere, maybe in Japan or the West Coast has some feeling and you also feel that. They are happy and you are happy, they are upset and you are also upset, hasn’t this happened to you? That is a level of communication that happens. It is a very subtle and ethereal level of communication. Yes, it is there. It is not as obvious as a cell phone, for some, but if you observe and look back you’ll see. Q: What exactly is meant by forgiveness? I am trying to forgive someone but I feel like I am not able to do it a 100%. I am wasting lots of time and energy on it, but I can’t stop thinking about it. What should I do to truly forgive and move on? Sri Sri Ravi Shankar: Just forget the whole business of forgiving. I think you have too much free time. Come to the kitchen and wash the dishes there. If that is too light a seva, go up and down the stairs about ten times. When you are physically exhausted, your mind will stop thinking about that person also. If you are going around thinking about somebody feeling hateful, angry, revengeful and all that, it is your strong craving for something, or aversion to something which is making you do this. You better get on to doing some seva. I tell you, it will definitely help you. Don’t forgive, never mind. Go to the kitchen and take especially that vessel which has to be scrubbed very well; take a brush and keep scrubbing with all your force. If the floor is dirty somewhere, put some soap and think of that person, and put all your strength and wash the floor. That may be a very good way to let out your anger towards that person. I don’t think there are enough coconuts here, or I would tell you to take some coconuts and one by one break them. Break the coconuts and may be some relief might come to you. I’ll ask if there are any vessels in which the food got burnt, for you. Scrubbing the burnt vessels, that is a very good idea. If there are many people then cooks will have to allocate the vessels that way. Q: I have been with my husband for seven years. For the last two years I have been having problems with his family. I hate his father. I try to avoid his family so that we have no problems, but his father has the ability to push my buttons. Sometimes I wish I can kill him. How to deal with the situation? Sri Sri Ravi Shankar: I would like you to take two days off and go and do some service in a mental hospital. Just stay with mentally deranged persons for two days and do some work there. When you volunteer in a mental hospital, then you will know how to deal with crazy people. If they are crazy what will you do? You will handle them with patience. You don’t go and slap them or strangle them, isn’t it? I tell you this is a very good exercise, going to a mental asylum and doing seva for one or two days and if that is less then go for a whole week. It is good. Then you will know that there are similar people at home and everywhere. The world is full of mental people, some are in the asylums and some are outside, only they don’t have the label. Then you will get enormous patience to deal with all of them. For your own sake don’t do anything that would put you behind bars, okay! Sometimes when your own father or mother makes a harsh comment, you don’t mind it. You have taken many harsh comments from your parents and it stays with you for one day and then it just blows away. But when the in-laws say even half of what your parents would’ve said that goes right inside and makes you very upset, isn’t it? Now you have to reverse the role and think, suppose they were your own parents, how would you handle it? It would make a big difference. Just when we throw some light on these facts, our attitude changes and then our circumstances also change. Q: How can one be enthusiastic but dispassionate at the same time? Sri Sri Ravi Shankar: That is the real skill. When self-interest is not there then it is much easier. Like when you do seva, you are passionate as well as dispassionate, isn’t it? So many of you are doing seva in kitchen, are you not doing it passionately? At the same time it doesn’t matter to you as well, right! There is passion and there is dispassion. The best thing is the seva here, the transport seva, the housing seva, the van running up and down, and putting the mattress till 12 o’clock at night. I took a round nearly at midnight and I saw these boys and ladies taking the mattresses and making the beds, making sure everybody is comfortable. They were not doing it for recognition. They didn’t do it because they were getting something out of it. They were not even thinking that they would get some big merit by doing it. It needed to be done and they just did it. There was passion and at the same time dispassion. They went and slept happily and comfortably. This was with everybody. I am just giving you one example; it is the same with all the sevaks. There is passion and there is dispassion. Seva is the best example of having both together.